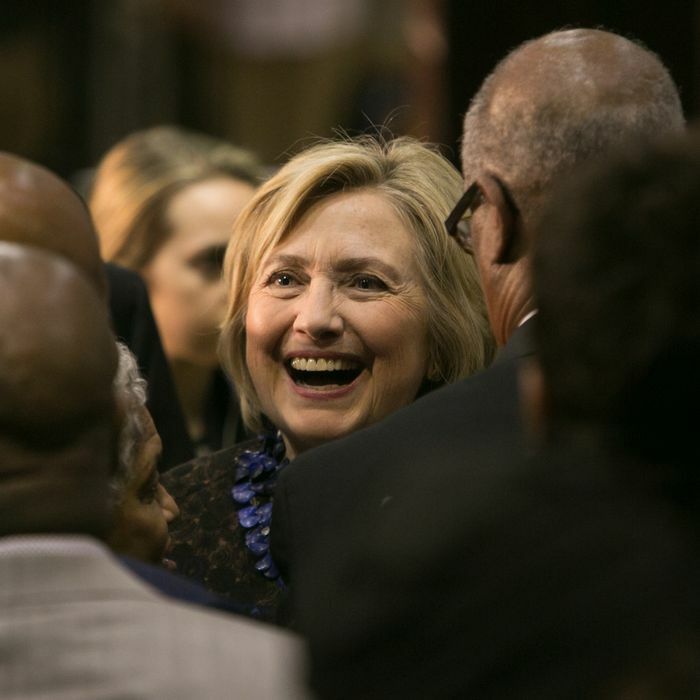 African-American support for Hillary Clinton asserted itself again in Wisconsin and accounts for her firm command of the Democratic primary. It is likewise the source of befuddlement and consternation among Bernie Sanders’s supporters. Sanders has energetically promoted racial justice and attracted numerous high-profile black surrogates, all of whom earnestly see his brand of left-wing politics as a natural fit for their community. And African-Americans form the bulwark of the Democratic base, just as white southern Evangelicals do the Republican base. But while white southern Evangelicals have relentlessly pushed their party rightward, by supporting the tea party and other conservative activist movements, African-Americans have played nearly the opposite role in the Democratic Party, helping its mainstream wing to crush its ideologically purist insurgency. From the perspective of a Sanders loyalist, the behavior is puzzling. Why would the party’s most underprivileged community exhibit the least radical tendencies? Clinton’s dominance of the African-American vote has been explained as a residue of the long-standing ties she and her husband have built over decades on the national scene. Sanders’s failure has likewise been attributed to his decades of confinement to the flamboyantly white state of Vermont. Both factors have surely played a role. But there is a larger and more durable force behind the African-American place in the Democratic Party mainstream: a long historical tradition of highly rational electoral pragmatism. The Democratic primary is a reprise of the classic purity-versus-pragmatism conflicts that periodically break out in both parties. Purists (on the left and the right) cast voting in morally absolute terms. They believe a hidden majority of the electorate shares their preferences, and a sufficiently committed, eloquent, or uncorrupted leader could activate that majority. Sanders is a classic proponent of this worldview. He has portrayed conservatism as simply a false consciousness constructed by big money and a biased news media, and something that would, in an uncorrupted system, be reduced to 10 percent of the public or less. Pragmatists read the electorate much more pessimistically. They recognize that the other side votes, too, and, having lowered expectations of what is possible in the face of a divided country, recognize that progress will be incremental and weighed down by compromise — sometimes with truly odious forces. That is the history of even the most spectacular episodes of progress in American history. Abraham Lincoln, who was holding together a coalition of voters that included supporters of slavery, refused to support abolition until the very end. Franklin Roosevelt needed the votes of southern white supremacists, and had to design social programs to exclude southern black people in order to pass them through Congress. No community in the United States is more aware of the power of its enemies than African-Americans. For most of American history, the franchise itself was denied to black voters, who leveraged their precious vote for whatever they could. That did not mean holding out for politicians who would treat them as equal human beings, but merely supporting the less-bad party. In the first half of the 19th century, writes Daniel Walker Howe, “wherever black men had the power to do so, they voted overwhelmingly against the Democrats” — despite lacking anything like a racially egalitarian party to support. The emergence of the Republican Party in the middle of the century provided a vehicle for African-Americans to exercise more leverage. When neither party offered any positive inducement, as they deemed to be the case in 1916, black civic leaders stayed neutral. New Deal progressivism allowed northern blacks to form an influential bloc within the Democratic Party. Initially, they were overwhelmed by the power of white Southerners — who, under Roosevelt, even blocked such tepid measures as anti-lynching laws — but eventually prevailed to turn the Democrats into a pro-civil-rights party. (African-Americans multiplied their voting power by engaging in social activism, which was itself calculated to divide their enemies from middle America.) That pragmatic tendency was on display in 2008, when black voters were slow to embrace Obama’s candidacy, waiting until he had demonstrated the ability to win over white Iowans before committing to him. And pragmatism inflects the African-American view of how politicians perform in office. Purists see compromise as a sign of moral failure or weakness, an inability to smash a corrupted system. Pragmatists expect political opposition as normal and enduring. A politician who has their best interests in mind and pushes policy in the proper direction is better than the all-too-common alternative. Sanders’s campaign draws much of its strength from the left-wing critique of Barack Obama’s presidency, which it dismisses as largely feeble half-measures. Sanders has attracted Democrats most discontented with Obama’s progress, while Clinton wins those most satisfied, among whom African-Americans are disproportionately represented. Obviously, Obama’s status as the first black president creates a unique bond with black supporters, but much more than racial affinity is at work here. 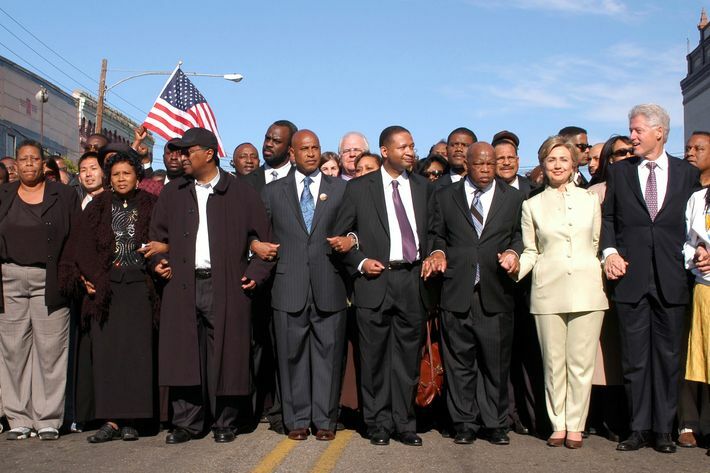 As Brett Gadsden, a historian and professor of African-American studies at Emory, told me a few months ago over email, “Black voters have always [been] faced with the difficult choice between candidates who have only offered incremental support for their concerns and have been perfectly willing to turn their backs, albeit to slightly different degrees, on black communities when it was politically expedient.” The decision about how to exert leverage (which is necessarily limited within a racially polarized electorate) is difficult, even agonizing. Any political constituency must navigate the twin imperatives of supporting the better (or less bad) party without letting that party take its support completely for granted. That refusal to accept the necessity of compromise in a winner-take-all two-party system (and an electorate where conservatives still outnumber liberals) is characteristic of a certain idealistic style of left-wing politics. Its conception of voting as an act of performative virtue has largely confined itself to white left-wing politics, because it is at odds with the political tradition of a community that has always viewed political compromise as a practical necessity. The expectation that a politician should agree with you on everything is the ultimate expression of privilege.